Oahu Vacations have everything - the scenic beautify of a Pacific island paradise, the amenities of a big city, and plenty of fun things to do everywhere you look. 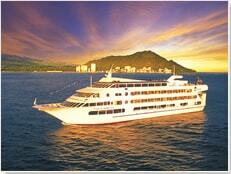 Honolulu tours and Waikiki tours are a great way to do some sightseeing in Oahu. No one could forget the history - there are many quality Oahu Pearl Harbor tours to show you in person the tragedy that brought the United States into World War II. 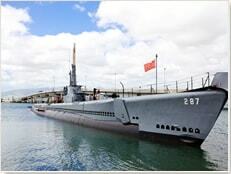 There are manu more Oahu attractions to visit in the metropolitan area. Travel just a few miles from Honolulu and Waikiki, and the manmade structures give way to this truly Hawaiian natural wonder. There are waterfalls, volcanic craters, beaches, hiking, and much more! 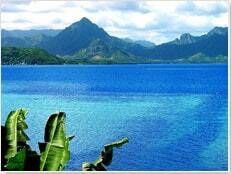 Hawaii Vacations offers many Oahu activities and Oahu tours to help you enjoy this most outstanding Oahu trip. You'll want to see Diamond Head - the massive crater that looms over Honolulu. Back when boat was the only way to travel to Hawaii, Hawaiian visitors would throw their leis into the sea as they passed Diamond Head in hopes that like the lei, they would return to Hawaii. Speaking of Leis, its a great way to start your vacation. Hawaii Vacation's friendly greeters will meet you when you arrive at the airport just as you begin your Hawaii Vacation. 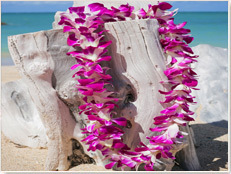 Choose from many different Hawaiian leis and treat yourself and your family and guests to an authentic Hawaii tradition. There are many Things To Do in Oahu. Hawaii Vacations Oahu Tours show you to Oahu’s most popular places such as Pearl Harbor, Dole Pineapple Plantation, and really fun Oahu activities like Horseback riding, Fishing, and Biking down a Volcano - Haleakala. Take an Oahu Movie Tour and see the sets of hit movies and TV shows like Lost. Get a different perspective of the island on a helicopter tour. 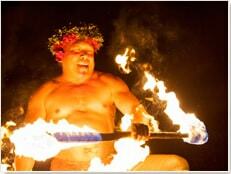 Enjoy authentic Hawaiian cuisine at and polynesian entertainment at an Oahu luau. You can catch the perfect wave at the North Shore, a legendary surfing spot. 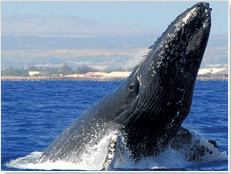 Other fun Oahu Tours include dinner cruises, snorkeling and windsuffing. Those who crave adventure can go on a kayak tour, ride a motorcycle, go parasailing, jet skiing, or even go diving with sharks on a shark encounter. 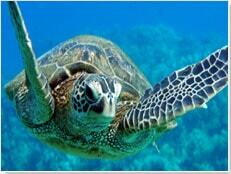 If your Oahu Travel includes children there are various Oahu Activities that are perfect for the entire family. Go Boogie Boarding at Kailua Bay. Descend 110 feet under water on a submarine tour. Kids also love Sea Life Park where you can swim with dolphins and other amazing Hawaiian sea life. 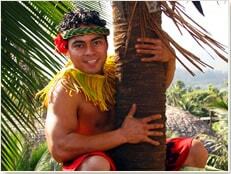 These are just some of the excellent Oahu activities and Oahu tours offered by Hawaii Vacations. Expect the best Hawaii activities at the best prices - Save on your Oahu activities and tours and make the most out of your Oahu vacation. We have all the Hawaii travel information about the different Oahu activities, Waikiki tours, Honolulu Tours, Pearl Harbor Tours, and other Oahu tours to suit all your interests. While you research, you'll notice how much you can save on Hawaii activities if you reserve your Oahu activities ahead of time through Hawaii Vacations. Reserve Oahu Activities in Advance! Hawaii Vacations makes Oahu Travel fun and easy! Oahu has something for everyone. Oahu Activities are very popular and many are booked in advance so reserve your spot today. Don't stress out while you're on vacation! Imagine wasting hours trying to get your family into some Oahu activity that is completely booked?? Your vacation time is too valuable! 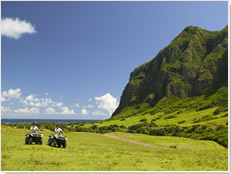 Hawaii Vacations makes it easy to book Oahu tours and activities in advance. Let us help make your dream Oahu Vacations a reality!